In 1973, Journey, formed as a progressive rock/jazz fusion group, had made their first studio recordings as a band. This was before Journey even had a name for themselves, although it was said that the band was called Birthday at this point, but it is not certain. 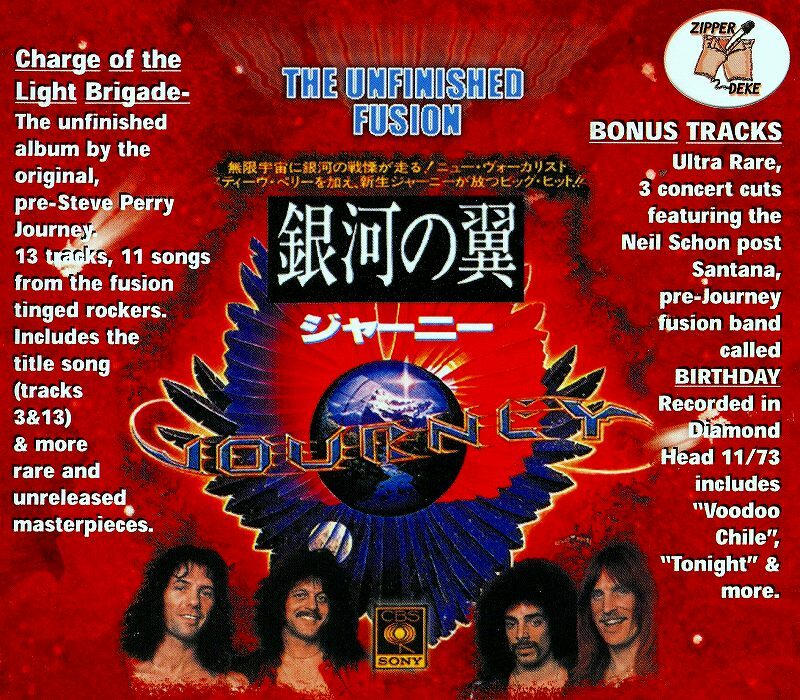 Guitarist Neal Schon and lead vocalist/keyboardist Gregg Rolie had just left Santana at this point, with Frumious Bandersnatch members Ross Valory and George Tickner joining them as well. Prairie Prince, who had just left The Tubes for a while, became Journey’s first drummer. Together, they recorded a demo tape that was known under the title Charge of the Light Brigade. If you expect Journey to start out in a grandiose poetic turn of traditional classical stylings (the title was from an 1854 British poem by Alfred Lord Tennyson), you will not find that style on these recordings. So far, much of the songs were the same as those from the band’s 1975 self-titled debut album, but in different versions, some of which were incomplete and had no vocals dubbed onto them. The reason why the band never bothered releasing this album or anything from it was simple: the drumming style of Prairie Prince was way too complex for Journey’s music. This was of course why he left the band shortly after this demo tape was recorded, in order to focus on recording and performing with The Tubes. “Mystery Mountain”-This pretty much has the same structure and lyrics as the track of the same name from the first album, but it was an unfinished studio mix. “In the Morning Day”-This is an instrumental version of the same track from the album. However, the section with the killer guitar and organ solos is at a much slower tempo, and there is no phasing effects compared to the album version. “Charge of the Light Brigade”-The title track is a heavy rocker featuring blazing guitar riffing, killer solos, and amazing organ work. I’m still not sure why this track was never released. “Untitled”-This jazz fusion instrumental is filled with atmospheric guitars, soft marching drums, a mellow bassline, gentle Hammond organ, and really jazzy electric piano. It later changes to a more faster tempo, ending with a more atmospheric outro. “To Make Some Music”-A different version of “To Play Some Music”, but with no vocals. “In My Lonely Feeling/Conversations”-An instrumental version of the album track. “Angels from Heaven”-A folky instrumental ballad beginning with gentle acoustic guitars, before drums turn this into a more electrified version. “Can You Hear Me?”-This Santana-style jazz fusion track begins with an electric piano boogie, before percussion and guitars enter. Gregg Rolie sings this song in a more softer, soothing manner. “Kohoutek”-This is a very, very, VERY different version of the space rock instrumental from the album. This time, it has the same musical structure and melodies as the track “Topaz”, also from the album. However, no synthesizers were used in this version. In fact, the whole demo tape didn’t have any synthesizers at all! “Out of Control”-This is a mixture of jazz fusion and hard rock, beginning with a drum solo, before a fiery guitar comes in. “To Make Some Music (Alternate Mix)”-The title says it all! “See the Light”-The demo tape’s shortest track, clocking in at 1:48. This is a fast-tempo rocker filled with hyperspeed guitars and organ. At some points, the song slows down in tempo. “Charge of the Light Brigade (Alternate Version)”-The same as the title track, but with a much faster tempo, and the guitar is more distorted. Why the Music of Germany’s Petards Need to Be Heard Abroad! Wow! They are WAY Ahead of Their Time!